The Red Flag of communism was first used in China, interestingly, back in the twenties when Soviet Republics were set up in various places around the world. The Red Army was formed back in 1928 with another red colored flag, which in fact bore characters for one and eight alongside the gold star, which is different from the star that was used by the Soviet Union. 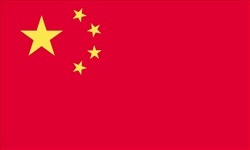 By the time 1949 hit, the Communists had come to control all the country of China except for Taiwan, and the republic was introduced by presenting a new national flag. The Chinese flags today is not hoisted on Chinese flagpoles alone. It flown from poles throughout the world. Click here if interested in Chinese flags.